Tickets for the 2019 Festival are selling fast. Book them online on this website or from the Tourist INformation Centre in Winchcombe. This year there is a special offer with Sudeley Castle. You will get reduced entry during the week of the Festival on production of a Festival ticket – £12.50 for adults, and £4.50 for children. (One reduction per ticket). 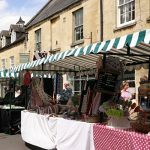 Winchcombe will be holding its annual Street Fair on Monday 27th May 2019, as the final event in the Winchcombe Festival of Music and Arts. North Street, Winchcombe, will be closed to traffic and there will be stalls and street entertainment. This event is growing in popularity every year and attracts large numbers of people. We are now taking bookings for stalls. If you would like to join us, please click here to download the 2019 booking form. We would love to hear from you. The cost of a stall is £40, or £35 if the booking form and payment are received by 31st December 2018. Details of how to pay and where to return the form are on the form. We were saddened to hear that Malcolm Ranieri FRPS passed away in October. We were honoured that Malcolm led the Steam Railway photography workshop during our 2018 Festival and appreciated his amazing passion and knowledge from planning it right through to the very last moment of the day itself. We extend our sincere condolences to his family. Planning for the 2019 Festival has already started. We are hosting an Open Evening at the White Hart at 7pm on Monday 12th November. At this informal event, we’d be happy to buy you a drink in exchange for your ideas for the 2019 Festival. It’s also an opportunity to find out more about getting involved – either in the build up or helping during the Festival itself, which will be held from Monday 20th May to Monday 27th May. If you can’t make it to the meeting but you have ideas or want to become involved in the Festival, email us at “enquiries.wfma@gmail.com”. Your opinions are valuable and will help to shape next year’s Festival. Follow the Festival on Facebook and Twitter for latest updates. The Festival is now over for another year and we hope that you will agree that it has been a wonderful week. The organising team would like to thank all those who contributed to the success of the Festival 2018: the performers, the artists, ours sponsors, our many supporters and volunteers and also all those who came along to enjoy the events. Don’t forget to click the Pink button at the foot of the page to give your feedback if you haven’t already. Your opinions are valuable and help to shape next year’s Festival. If you would like to be involved in Winchcombe Festival of Music and Arts 2019, please email us at: enquiries.wfma@gmail.com. A terrific ukulele workshop on Saturday from Sarah Kelly!! If you’ve been bitten by the bug and want to take it further, either contact Sarah on skellyuke@gmail.com or find out more about lessons with her at http://uke-can.vpweb.co.uk/. Jazz In The Garden is under way with the Spa Notes. Intermittent drops of rain are not dampening the atmosphere. Tonight (8.00 Sunday) at Toddington Village Hall, The Zen Hussies help us celebrate a superb week at the Winchcombe Festival. Tickets available online or at the door from 7.30. And don’t forget the Street Fair and Festival Fringe on Monday in the Town Centre. The fun starts at 10.00 and includes a chance to take part in Winchcombe’s first ‘Big Draw’ with Gemma Hastilow. Don’t forget our Saturday workshops for those aged from 7 to 107 at the Abbeyfields Community Centre. Still spaces on Oh Yes Uke-Can ukulele workshop (10am) and Family Art (11.15). £3 per person, accompanied children free. Some events are now very close to selling out. In particular, the Harmonica Workshop at the White Hart on Saturday and the Pearl Stringing Workshop on Sunday which each have less than 5 places left. And don’t forget, at Toddington Village Hall we have Cheltenham Operatic & Dramatic Society Choir (7.45 Saturday) and The Zen Hussies (8.00 Sunday). Tickets available online or at the door. Click here for the At A Glance page to see what is still to come. Unfortunately Wednesday’s performance by the Tewkesbury Town Band had to be cancelled. Instead, why not try either Susy Firth’s Boulevard Of Broken Dreams at St Peters or Fiddlers Two at the White Hart. More events are selling out and many have only a few tickets left. In particular, the Photographic Workshop at the Steam Railway and the Pearl Stringing Workshop each have less than 5 places left. Tickets are also going quickly for #Blame Bev at Toddington. As well as buying on line on this website, you can buy your tickets at the Winchcombe Tourist Information Centre or by phone (01242 602925).